A tiny tool to re-mount write-protected NTFS volumes under Mac OS X 10.9+ in read-write mode. You will be notified if there is any volume connected to the computer which is NTFS formatted and ready to re-mount in read-write mode. Mounty for NTFS comes without any decorations. No additional driver will be installed. It simply makes use of the build-in mechanisms already provided by Mac OSX Mavericks - no strings attached. Mounty for NTFS is available for free. You can get it here right now. From the icon in menu bar you can always bring a finder window to front to manage the contents of the mounted drive. Occasionally I need to share files with my colleagues via USB sticks. Since we are working on different platforms the sticks might be NTFS-formatted. No problem so far, there are several resources out to the web describing to accomplish this task, e.g. However, tired of typing this over and over, I have written Mounty to accomplish exactly this - but in a much more convenient fashion. 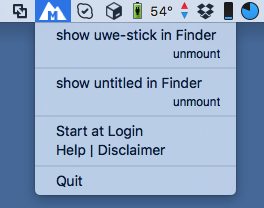 So, under the hood, it happens an unmount and a remount short after, followed by opening a Finder window pointing to the hidden mount point. Please let me know if this tool is also useful to you; and do not hesitate to ask a question that might appear using Mounty. My USB stick will not re-mount. An alert is popping up telling me to re-attach the stick, but this doesn't help. This can happen when the USB stick is not cleanly unmounted from the Windows PC. If you simply unplug the USB stick from PC without using the little tray icon to detach the hardware correctly, the volume will be marked as "not cleanly unmounted". 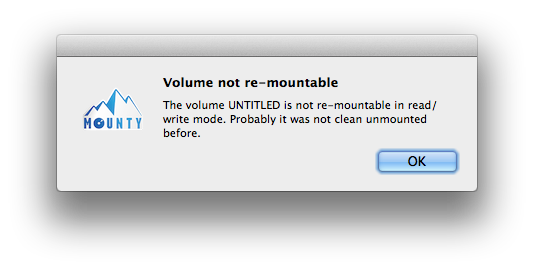 There might be some dirty sectors left and Mac OS X will not be able to re-mount in read-write mode for that reason. Suddenly all my files disappeared - please help! This is usually happen when not all files are written properly due to an unmount operation not finishing. The NTFS partition might be marked as "dirty" and the Apple NTFS driver cannot recover from that situation. Mounty will not delete anything by itself, please try to restore your files on a Windows PC using usual recovery s/w, i.e. chkdsk command line utility or professional tools like GetDataBack for Windows. If you do not own any Windows you can use tools for macOS that can deal with NTFS partition maintenance, like Paraogn Harddisk Manager or Tuxera Disk Manager. Sometimes the files are grayed out and cannot be modified anymore. If you try to mount a Windows System partition, Mounty might fail when Hibernation feature is enabled. There is a Fast Start feature in Windows which might be enabled by default, and this is causing the drive to be locked. Within Windows running, you need to run the command powercfg /hibernate off in an admin powershell and restart Windows to disable this feature and remove the lock to enable it for Mounty. Thanks to Art Schultz pointing that out. As far as I have tested, this version runs perfectly on Mac OS High Sierra. Localizations (incomplete and made by Google. If you want to contribute, please download the Localization String File, correct it, and send new version to me). Added new status: Mounts is operating: The re-mount of larger volumes can take a while. When mounts is working you cannot accidentally issue another action anymore. Added modal alert when drive has spaces in names: I am using DADiskMountWithArguments API from Disk Arbitration framework and when there are spaces in volume name the remount action will fail with unknown error. If you have an idea how to solve it, please let me know. Fixed a problem where volumes appears as not re-mountable by mistake intermittently. The Appstore Sandbox restrictions does not allow sandboxed apps to re-mount external volumes. 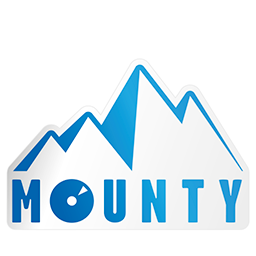 We have rejected Mounty from Mac Appstore for that reason and decided to distribute it for free, without Sandbox capability. Mounty uses Apple's Notification Center to issue notification whenever a NTFS volume to re-mount is detected. If you want to re-mount a volume from a notification please change the alert style to "Alert" for Mounty from Notification Center Settings in System Settings application. The Mounty NTFS Tool is provided "as is" without any warranty of any kind, either expressed or implied, including, but not limited to, the implied warranties of merchantability and fitness for a particular purpose. The entire risk as to the quality and performance of the program is with you. In no event will the author of this tool or any of its partners be liable to you for any damages, including any general, special, incidental or consequential damages arising out of the use or inability to use this program (including but not limited to any loss of profit or savings, loss of data or a failure of the program to operate with any other programs), even if the author of this tool or any of its partners has been advised of the possibility of such damages.